Okay, one last post before disappearing for awhile because blogging is one of the few things in life that makes me smile for no reason in particular and those are the best sorts of smiles now aren't they? 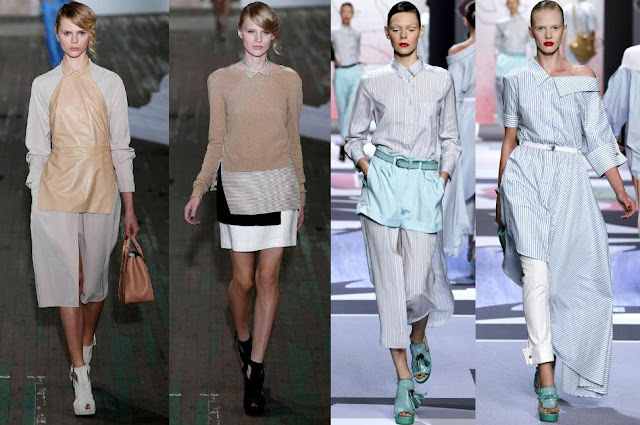 Some of the looks that came down the Spring/Summer runways had me questioning just exactly what sort of garment they would be classified as. For example, Phillip Lim's Apron-meets-collar-meets-dress ensemble or Viktor & Rolf's dress/off shoulder shirt/tunic. And this reminded me a lot about Plato's realm of ideal forms. Plato questioned what made say a shoe, a shoe? What would it mean to claim that something is a shoe? At first you might say well it is something that you wear to walk in that covers and protects the foot, but what if a shoe does not provide protection? What if a shoe is made that is never worn or walked in? What if a shoe does not cover the entire foot, but only bits or pieces? Exactly what is the essence of a shoe? Plato argued that there exists a perfect form of shoe and every other entity imaginable called their ideal form. They are unchangeable, ideal, and consistent forms of everything in this ever-changing and temporary world of ours merely emulates with imperfect copies. We can never come to know these ideal, true forms directly, but we come to understand them. Thus, shoes in our everyday lives are considered shoes because they partake of these ideal forms. Abstract concepts such as justice and beauty also have their ideal forms according to Plato. 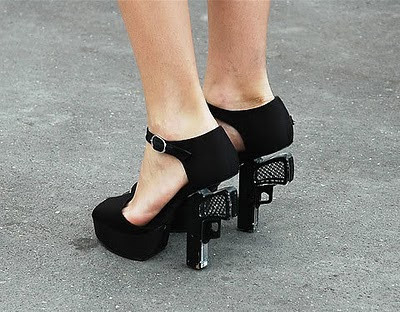 I must have those gun shoes.Those are amazing. ughh. the last two "shoes". no heel and soleless = terrible. I like those gun shoes, but the rest look horrible. Love those shoes, really unique! what the hell was someone smoking when they created a toeless shoe....toes are so ugly....I like a little toe cleavage...but this is craziness.